Final approval has been granted to one of the world’s largest solar projects, the $104.7 million Kogan Creek Solar Boost Project, the Australian Federal and Queensland State Governments have announced. CS Energy’s 750 megawatt (MW) coal-fired Kogan Creek Power Station near Chinchilla in southwest Queensland will soon be home to a 44 MW solar thermal addition representing the largest solar project in the Southern Hemisphere and the world’s largest solar integration with a coal-fired power station. CS Energy Chief Executive David Brown said that the innovative solar project represents one of the most significant investments to date in solar thermal technology and is part of CS Energy’s commitment to producing cleaner electricity from existing coal-fired power stations. The Kogan Creek Solar Boost Project will increase the amount of electricity generated by up to 44 MW during peak solar conditions, providing an additional 44,000 MW hours of electricity per year. “In simple terms, the solar addition will enable Kogan Creek Power Station to produce more electricity with the same amount of coal,” Mr Brown said. The project will use AREVA Solar’s Australian-pioneered compact linear Fresnel reflector (CLFR) technology to supply additional steam to the power station’s turbine, supplementing the conventional coal-fired steam generation process. The technology uses heat from the sun to convert water to steam with zero emissions. It is the most land-efficient solar technology, generating 1.5 to 2.6 times more peak power per acre of land than competing solar technologies and is the only CLFR provider to supply superheated steam which has specific application to the power generation market. “The location is ideally suited for a solar thermal system due to the good levels of solar insolation, or more simply the amount of sunshine, in the region,” Mr Brown said. “Already Kogan Creek Power Station is one of the largest and most energy efficient power stations in Australia’s electricity market,” Mr Brown said. The solar power will also be generated directly into the electricity transmission grid. The Australian Solar Energy Society (AuSES) has welcomed the announcement of the Federal Government funding for the Kogan Creek Solar Boost project. “This is an excellent example of the potential of Big Solar to help combat Australia’s emissions, and create jobs and investment in regional Australia,” said John Grimes, Chief Executive of AuSES. “Pricing carbon provides an opportunity to do much more, and we call on the federal government to use a portion of the carbon price revenue to target Big Solar”. Construction on the Kogan Creek Solar Boost Project is scheduled to commence in the first half of 2011. This project is distinct from the CS Energy Solar Flagships program project, although both are located at the same sight. 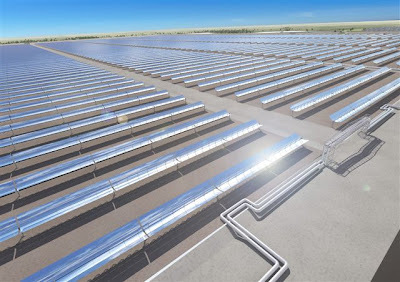 CS Energy is in partnership with Parsons Brinkerhoff, Siemens, John Holland, Infrastructure Capital Group, the Queensland University of Technology and Curtin University to develop the Solar Flair Project, a 600 MW solar thermal project based on based on Parabolic Trough Collector technology.